Established in 1990, Bluco is the leader in precision modular fixturing for welding, machining, and assembly. We deliver the highest quality components, tables, services and customized solutions in the industry. Bluco’s application engineers work directly with our customers throughout the ordering process; delivering a comprehensive modular fixturing solution. Our steady growth is attributed to a high-precision product, a strong engineering background in fixture design and a diverse yet loyal customer base. We are committed to providing exceptional products, outstanding customer support, and unparalleled service. Our Application Engineers have extensive hands-on experience in all facets of fixture design, welding, fabricating and general manufacturing which translates to a complete understanding of what it takes to get the job done. Our engineers provide fixture designs to help you select the right system. Upload your CAD models here. To make the most of your new system, schedule an on-site training visit after you take delivery. Training is included with all purchases at no additional charge. An Application Engineer will go over the general functionality of your new system. With each training session, we pass on valuable knowledge on how to maximize the use of your tooling. Schedule a visit to our 5,600 sq ft Showroom to collaborate with our Application Engineers on your modular fixturing solution. If you would a more hands-on experience, bring your parts to our 7,000 sq ft Validation Center. 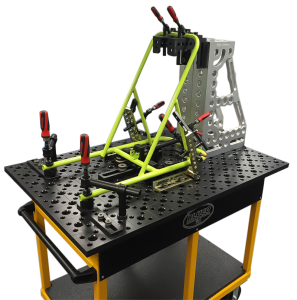 You and the Bluco team can develop a fixture concept- prove it out by building the fixture and welding the part. Our popular rent-to-own program allows users to take delivery of a complete modular solution at a fraction of the cost. Use the fixturing system for as long as you like with options to purchase or return the rental at any time. Bluco stands behind the quality of our fixturing solutions 100%. Our Lifetime Warranty repairs or replaces any component that breaks under normal wear and tear conditions for as long as a customer owns their fixturing system. We even offer a Lifetime Exchange and Buyback Program. Our full-service machine shop with in-house engineering can quickly respond to custom fixture requirements; meanwhile, the R & D team and Design Engineers are continually bringing new ideas in modular fixturing to life. We always extend a warm welcome to visitors who would like to come to our Naperville, IL showroom and get a hands-on, personalized demonstration of the latest in modular fixturing technology. Just call 800-535-0135 to make an appointment.